Yesterday I wrote about the man who discovered the first Bosnian Pyramids and was very grateful to be able to experience his talk a few weeks ago in person. It was enlightening and was cool to see a real life Indiana Jones character who spent so much time learning the value of pyramids and their potential power. 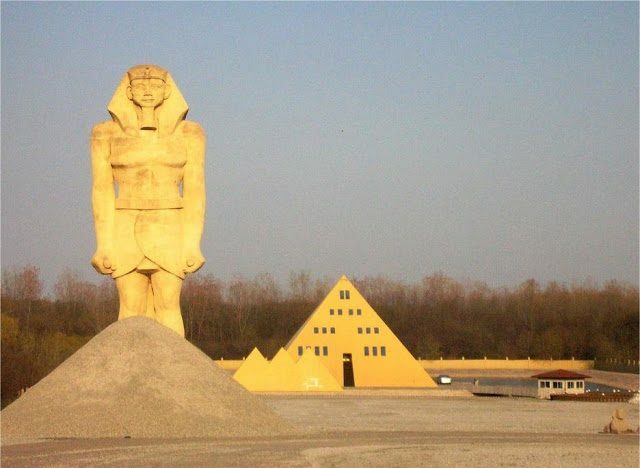 He mentioned a pyramid in Illinois that really caught my eye because of the effects it had after being built. One of the Onan sons was a botanist and the university he attended suggest that they grow inside the Pyramid. What they found was astonishing, they found that plants grew three times as fast in the pyramid than outside it. One day, Jim was talking with his wife Linda about what kind of home they should build and Linda jokingly said “Why don’t you build it out of a pyramid” and that gave him quite the idea, he was going to build his families home as a pyramid structure, and he did. He built the Pyramid home for his family and it was an exact replica model of the Pyramid of Giza at 1/9th the size. As the building came into completion and the pyramid form took shape something astonishing happened. The middle of the home started bubbling up with water and the spring water started entering the first floor (the bottom) of the pyramid. Astonished and confused, they scrapped the plans to have an indoor pool on the first floor of the pyramid and instead had to bring in experts to reroute the water to funnel it out of the pyramid home and into the surrounding area. Some say that the shape of the pyramid itself helped to bring this spring to life and fill the surrounding area with spring water. This is really the only conclusion that I see considering there was no water there before and once the pyramid took shape this is when the water started bubbling up. Quite incredible huh? A pyramid structure helped to bring spring water to the surface. Additionally Jim Onan was very passionate about Egyptian architecture and culture and decided he wanted to coat the pyramid in gold. 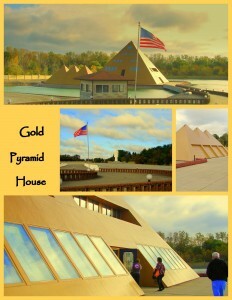 He coated the pyramid in 24-karat gold surrounding the whole pyramid costing an incredible $1 Million US dollars. This is now the largest golden plated structure in North America. Naturally, this structure got a lot of attention from the local community and the press and it got a lot of exposure. Tourists started flocking by the thousands and they created a tourism business out of it. One man named Ralph who was working on this Pyramid in Illinois drank the spring water everyday while working on the pyramid and he came back from his doctor reporting that his blood pressure was lower. This could all be the placebo effect (mind over matter) or there could be some validity as we now know that water is living and to charge water and for it to be alive has more health value. Spring water is already the best water you can get and for it to be positively charged (if it was in some way) then there could be potential there. 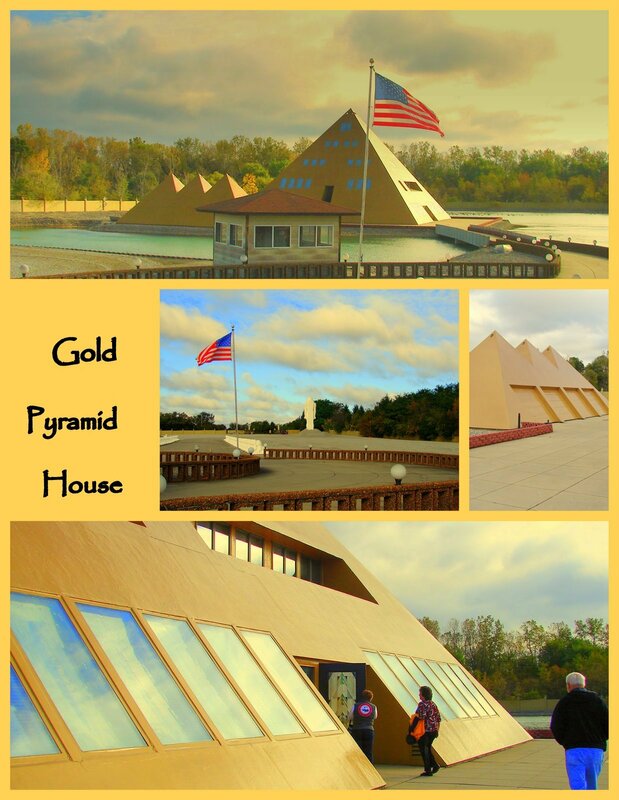 The story of Jim Onan and his family is incredible and I plan on visiting this pyramid one day in person to see it for myself, ask questions, and get the full experience. Posted in Strange PlacesTagged Pyramids, Michael JacksoncommentLeave a Comment on This Man Built a 24 Karat Gold Pyramid Home – You Won’t Believe What Happened Next!